What are some good Cane Corso dog names? In this article, we’ll look at Cane Corso dog names and we’ll also discuss the importance of choosing the right name for your puppy. All dogs have different personalities, so it’s important that your pup’s name suits him or her. Cane Corsos are undoubtedly tough-looking dogs, even though they are generally big softies at heart! So, a cool dog name that fits your Cane Corso perfectly is all-important. When it comes to naming a puppy, there will be an element of guesswork involved. After all, you won’t know what personality your pup will have as he grows up. However, you do know what color your Cane Corso will be and that he or she will be a large dog. As well as suiting your dog’s look, his name needs to fulfil a definite purpose. Choose a short name that’s simple for your dog to learn and remember. Avoid choosing really long names, even if they seem like a great choice, unless you can think of a suitable abbreviated nickname that your dog will be able to learn easily. When you’ve decided on a name for your Cane Corso puppy, be sure to have him microchipped, and don’t forget to get a name tag for his collar too. So, let’s dive right in and look at some suitable Cane Corso names. Your inspiration for Cane Corso puppy manes can often come from unexpected sources. For example, you might have a school teacher, a boss (now there’s a good name! ), or even a friend or family member whose name also suits your Cane Corso. But be careful if you do decide to use someone’s name; they may be offended! It might be a good diplomatic move to ask their approval before you name your puppy. Also, you can find inspiration for dog names among lists of baby names. The meaning of each name is usually listed in these books, so you could pick a name you like with a meaning that’s relevant. Or why not make up a truly unique Cane Corso name by combining two names? That way, you’ll be absolutely sure that no-one else will be calling the same as you are at the dog park! Female cane corsos can look just as strong and powerful as males. We’ve chosen these female dog names that could make your pup sound tough and strong, but feminine too. Some owners like to think “girl power” when choosing names for their female Cane Corso. Sometimes, rappers and bands come up with street-tough-sounding names that can be great for a Cane Corso. There are plenty of male dog names that look good on a macho Cane Corso. For more male dog names, check out our suggestions at this link. 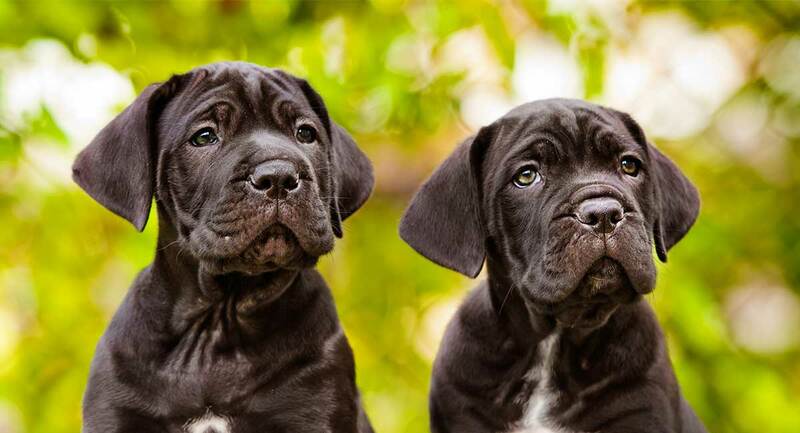 The Cane Corso breed originates from Italy, so why not choose an Italian name for your pup? Sometimes, the best Cane Corso names are those with particular meanings. Baby name dictionaries include the meaning of each name they contain. This makes it easy to find a really awesome dog name that perfectly suits your Cane Corso’s personality and look. 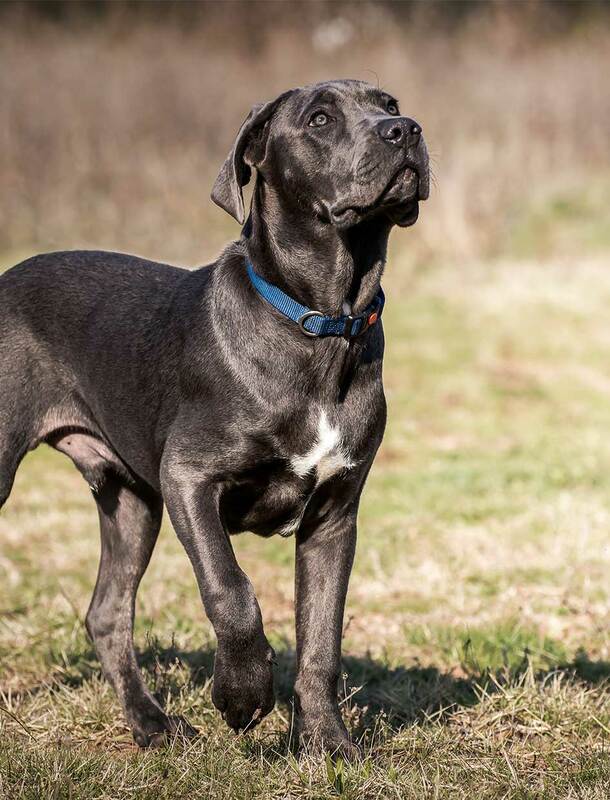 Famous figures from history can provide some brilliant Cane Corso names, especially if you want a name that reflects your dog’s strength and bravery. And it’s not just the boys who get to enjoy names taken from famous historical figures. Here’s a selection of historical names, just for girls! If you think that your Cane Corso has movie star looks or Hollywood teeth, why not name him or her after a movie character? Or if you have a favorite film, you could choose your Cane Corso’s name in honor of your favorite character. Now, even though your Cane Corso puppy will grow into a hulking, tough-looking hound, you’ll always remember his or her cutesy puppy looks. You might want to choose a cute name for your pup – just know that you’ll need a sense of humor when your dog grows up and you call him in the park! If these names don’t float your boat, check out this list of cute dog names for inspiration. Before you make your final decision on a name for your Cane Corso puppy, there are a few important things to bear in mind. Choose a name that has a maximum of two syllables. You can use a longer name if you see one that you absolutely love, but bear in mind that this can make it very difficult for your puppy to learn his name and come to you when you call him. If you have your heart set on a long Cane Corso dog name, always abbreviate it to a shorter nickname that your dog finds easy to remember and respond to. If you’re puppy is going to be a member of a multi-pet household, try not to choose a name that sounds very similar to that of your other dogs or cats. Don’t give your new puppy a name that sounds like one of the training commands you’re going to use. For example, from a distance, “Ray” can sound very much like “Stay!” That can cause no end of confusion if you want your dog to come to you. He won’t understand what he’s done wrong as he sits obediently on the other side of the park while you yell his name in vain! If possible, try to come up with a unique dog name or one that’s very unusual. There are hundreds, if not thousands of dogs that are called Rambo! You can only imagine how confusing it will be in the park if you pick a really common dog name! Picking the right name for your Cane Corso puppy is very important. You need to choose a name that you’ll always love; avoid novelty names that will quickly become stale. Pick an unusual name so that it is easy for your pup to remember and that your dog won’t get confused when you call him to come to you in the park. We hope you find inspiration in our suggestions for Cane Corso dog names! If you do choose one of our suggestions, please tell us in the comments section below. And if you already have a Cane Corso, we’d love to know what his name is and how you chose it!